Extraordinary opportunity for South African patient advocates to participate in the South African National Health Assembly (NHA) in alliance with the National Health Insurance Coalition. The People’s Health Movement (PHM) is hosting the event. The importance is linked to the National Department of Health’s proposed a 10-point plan to transform the health system and this includes the National Health Insurance (NHI). The NHI is in need of civil society engagement and citizen participation. This is a great opportunity to participate and learn and engage around how this process will affect you, your patients and our health system. It is also an ideal space to make inputs into how you see the NHI working and to place your best ideas on the table for discussion. 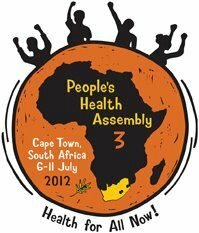 Registration form National Health Assembly 5-9 July 2012 NB THESE DATES INCLUDES THE GLOBAL, PEOPLE’S HEALTH ASSEMBLY, A SERIES OF HEALTH FOCUSED EVENTS!!!. PHM will facilitate this engagement and re-frame the mainstream discussion around the NHI while working to achieve universal coverage in South Africa. Who will be attending: Participants will include grassroots activists from communities around South Africa, policy makers, interested citizens, government officials and interested delegates from PHM Global countries (such as India, Thailand and Latin America) who are interested in taking part in the NHA. WHEN: 5th July 08:30 -18:30 (Thursday) and 6th July 08:30 -13:00pm (Friday). WHERE: University of the Western Cape, Bellville, Cape Town. WHAT: The upcoming National Health Assembly will play a catalytic role in rebuilding, re-energizing and unifying health civil society in South Africa and the broader global health community. Using the proposed NHI as a platform, the National Health Assembly is thus an ideal event from which to build momentum and mobilise civil society engagement in the NHI process and towards universal coverage in South Africa. Overall objective of the NHA is to mobilise a mass movement promoting the right to health for all and a progressive NHI . Consider ways to assist with the implementation of other aspects of the government’s 10-point plan with particular attention to those areas where civil society has key roles to play. Starts each day 2 hour plenary. Participants can select which sessions they would like to attend under the below themes. These will be facilitated by PHM but hosted by partner organisations and groups involved in the NHI Coalition. HOW: To register, complete attached registration form and send to coordinator@phmsouthafrica.org before July 5th, 2012.